Creating a safe and healthy environment for your fish is easy when you have the right tank. Our top pick for 10-gallon saltwater tanks is the Marina LED 10-Gallon Aquarium Kit. It's a beautifully designed tank that also has an LED lighting module that simulates the daylight. Light is a crucial part of an aquarium because it provides oxygen for its inhabitants and stimulates the growth of plant life. While many tanks require you to purchase a light separately, this tank includes it as part of the set. Here, the lighting is built into the tank’s canopy, with a natural look that accentuates the colors of your fish and aquatic plants. Plus, it's energy efficient! 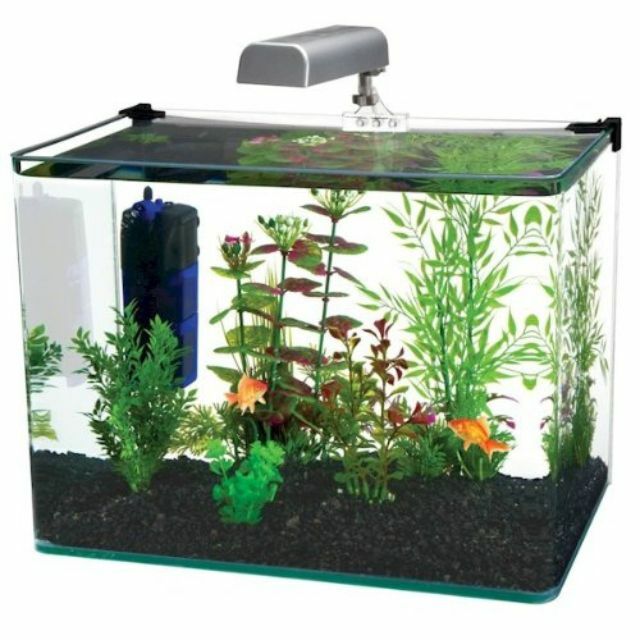 Measuring 22" x 12" x 15", the tank also includes a clip-on filter with quick-change cartridges for easy upkeep. Customers write that the lighting ensures plant life grows quickly and fish stay healthy, adding that it’s the perfect setup for a novice. It’s also a breeze to put together, with clear and easy instructions. Even without any marine life, the Penn Plax Curved Corner Glass Aquarium is beautiful to look at. True to its name, this aquarium features a curved design that’s contemporary in style, with a smooth, frameless edge that’s not as boxy as a regular tank. Best of all, the seamless glass makes for unobstructed viewing. The tank measures 17" x 11" x 12" and includes an LED light, internal filter, mat, and hinge-style plastic lid. Customers say this Penn Plax tank is absolutely stunning, with clear, sturdy glass and top-of-the-line design. “Throw out the rest” of your aquariums, one Amazon reviewer writes—it’s built with the kind of quality that delivers on its good looks. If you’re just dipping your toes into the world of fishkeeping or looking for the perfect aquarium to surprise your science-loving child, the Aqua Culture 10-gallon tank is the way to go. This starter kit has nearly everything you need to get your aquarium up and running, including a hood, energy-efficient LED, internal filter and some fish food to get you started. The affordable price also earns extra points in our book. Reviews say that this tank is just right for starters, combining an affordable price with an array of tools that can add up if bought separately. While some customers say the lid is on the flimsy side, the filter is quiet and the price makes it a worthwhile starter tank. If you care for fish that are native to warm, tropical waters, you’ll need to invest in a heater for your tank. The good news: some aquariums come with one included, like this Aqueon Aquarium starter kit. While it’s a bit more expensive than the starter kit from Aqua Culture, the heater provides a major benefit. It comes preset at around 75 degrees Fahrenheit, making it perfect for popular tropical fish, like bettas. The tank also includes an LED hood, fish food and a filter that flashes when it's time to change the cartridge. It measures 20" x 10" x 13". Customers say the tank couldn’t be easier to assemble, and the heater keeps the water perfectly acclimated for their tropical fish. The tank is also well suited to marine life of any kind—just don’t use the heater if you’re keeping goldfish. An aquarium hood serves several important purposes. Most importantly, it prevents the water from spilling and fish from jumping out of the tank. But it also keeps evaporation in check, saving you the trouble of repeatedly topping off your tank. This tank from All Glass Aquariums comes with a hood included—a perk that makes it a particularly economical choice (hoods can often run you an extra $40-50). This hood can accommodate two fluorescent bulbs, making it easy to control the light inside the tank. Altogether, it measures 20” x 20” x 24”. Customers say the All Glass Aquarium is a great product at a great price, although some advise that it’s not a complete kit (it just includes a tank and hood). Online reviewers also noted that this is easy to put together, which makes it great for children. A filter keeps your aquarium clean, removing food, waste and other particulate matter, ensuring your fish stay healthy and happy. While many starter tanks come with a filter included, it’s worth investing in a higher quality one that you won’t have to worry about or replace. The Marina Power Filter is a smart and affordable choice, with quiet operation and adjustable controls that allow you to change the level of flow inside your tank. It requires no priming and is designed to prevent fish from accidentally catching their fins in the intake. It’s compatible with any 10-gallon tank. Customers say this filter is so effective it’s left their tank clearer than two other models combined. They also love that you can customize it with any type of media (an insert that changes the quality of your tank’s water). Want to outfit your aquarium with an accessory that’s both stylish and sustainable? Check out the AquaSprouts Garden, where a bit of ecological magic takes the place of the typical mechanical filters. This mini-garden fits directly over a 10-gallon tank—the plants grow as they’re fertilized by the fish, while the plants themselves serve to clean the water. It’s not just a great way to keep fish—it’s a great way to grow herbs and veggies indoors. The kit includes the garden itself, a light bar that hangs overhead, a pump to bring water and waste up into the grow bed, and “grow media,” or a specialized clay-based soil that converts that waste into nutrients. Customers rave that this is more than a toy—it’s a great project and the perfect introduction to the field of aquaponics. Our writers spent 3 hours researching the most popular 10-gallon saltwater fish tanks on the market. Before making their final recommendations, they considered 20 different tanks overall, screened options from 15 different brands and manufacturers and read over 150 user reviews (both positive and negative). All of this research adds up to recommendations you can trust.